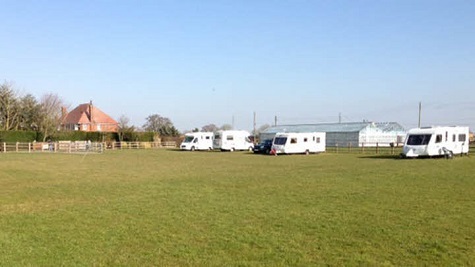 Grove Farm CL is a secure site located on a small farm in the beautiful Vale of Belvoir. We are an adult only site and welcome well behaved dogs. The site is half a mile from the Grantham canal ideal for walker and cyclists alike. There are several footpaths crisscrossing the area. Two good local pubs are within half a mile. The site is an excellent base for exploring the surrounding area being sited between Nottingham, Leicester and Melton Mowbray. We are twenty minutes from Melton, the rural food capital of the East Midlands, with it's famous Stilton Cheese and Pork Pies. The National Water Sports Centre, Trent Bridge Cricket Ground and Nottingham Forest Football Club is a 25 minute ride away. King Richard 111 Visitor Centre, Leicester Cathedral and the National Space Centre are within a 40 minute drive. The Loughborough Great Central Railway is a 25 minute drive away. Both Nottingham and Leicester have Park & Ride facilities. The two local pubs are the Plough Inn at Hickling which is the nearest and the Neville Arms at Kinoulton which provides a greater specialist food experience. Facilities : Adults only, Electric hook up available, Easy access, Suitable for Caravans and Motorhomes, Grass pitches, Toilet, Scenic views, Wi-Fi, Battery charging, Dogs allowed, Drive over waste disposal for motorhomes, Rally field available, TV reception fair. Nearby : Public transport, Fishing, Shop, Cafe/Tea room, Pub/Restaurant. Just spent a pleasant 3 nights at Grove farm chilling out. 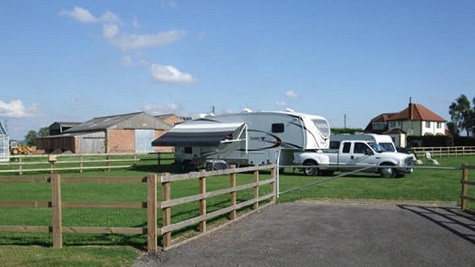 Upon arriving on site Chris could not of been more helpful and the onsite facilities are very good including freshly mowed grass and nice level pitches. Chris has thought of everything from your own gate key (nice to know all is secure when you are away from site) to an information sheet with a couple of local walks and places of interest. Nice coffee shop beside the canal in Hickling and pub opposite all within a 10 mins walking distance from site. Thanks again Chris we hope to return again soon. Top CL & Top Owner too. Late posting review due to tech hitch ! Arrived in pouring rain on Good Friday, Chris was waiting for us, said would we mind hard standing, due to really wet field, fine for us and our friends, he sorted electrics etc (even offers free WiFi) and was always on hand to help anyone. Like other reviewers, we tried The Plough pub, the Canal walks and the Canal Basin Cafe - all good. Had a great long weekend, and no mud ! Thanks Chris. Not an area we would normally visit but the close proximity of the Grantham Canal was the deciding factor. What can I say? A great welcome to a great site. Not a single thing to talk down. I had been impressed with the way Chris helped others when assistance needed little realising that I would also need his support! The car battery failed on the day of our departure but he had us mobile in no time at all. If you are a walker or part time cyclist, like me, then this is the place to go. The well maintained canal tow path provides access to walks / rides of various lengths. Many thanks Chris for a wonderful experience. Just had an overnight stay on our way back home. Super surroundings, Easy access to the site, best we have found.Chris was very welcoming and helped fix our brake away cable, nothing too much trouble. Good clean facilities. Will definitely come back for longer next year. We stayed on this site for five nights. Initially we had booked for four. It is a well run site, in a pleasant area and is fairly priced. Chris the owner, greeted us on our arrival, he explained what was where, gave us an A4 information sheet which outlined areas of interest. That was helpful to us. There is a bus stop, close to the site. We lookede around the church in the village, visited the local pub, The Plough, in Hickling, it was an easy cycle ride to get there. Another time we walked into the village, that too was a comfortable distance. There is a nice tearoom in Hickling, beside the canal basin. We cycled on the canal path which was a pleasure. There is lots of wild life around, plus fishing for those who enjoy that. All in all an enjoyable adventure. We hope to visit again before too long. What scorcher of a week that was! Wonderful welcome, shown to our pitch, all explained to us, inc. EHU, tap, toilet, bins, CDP, The site is so peaceful. Two pubs within walking distance and a lovely little tea room called `The Wharf`, at Hickling canal basin, Would love to use this one again one day. The first time we have visited this part of the East Midlands for a long time and with short notice we were lucky enough to find this lovely, scenic little site within walking distance of Kinoulton one way and Hickling the other. Chris, who takes care of you, was so helpful. He kept in touch on the day of our arrival (as the traffic was chaotic on M42/M6 and we were late arriving). Upon arrival he was on hand to show us around. The site is kept beautifully and as the weather was scorching we just relaxed and chilled. Half a mile walk to Hickling and you come across The Old Wharf Tearooms. Sit by the Grantham Canal and enjoy a cream tea or a delicious Victoria cream sponge or a light lunch. You can walk along the canal and if you're into fishing, buy a day ticket and enjoy. The scenery of the countryside is worth exploring, especially if you are bike riding enthusiasts. All in all a fantastic 4 day stay, that we were reluctant to have to end. We hope to return before the end of the summer. A real country haven! Views for miles around. Jan and Chris went out of their way to accommodate us and make us welcome when we were looking for somewhere in the area to try out our new Motorhome close to the point of purchase. A beautiful CL with 360 degree views and a toilet and washroom kept spotlessly clean. Also a sink area to wash dishes. We were met at the farm and taken down to the site and shown where things were and Chris gave us information about the 2 local villages, including a great place for breakfast in Hickling on the canal. However, I was taken ill, so that wasn’t possible but Chris and Jan made it possible for us to stay on. A couple from another caravan came to our aid too with medical support and the husband went for emergency food supplies for my husband who couldn’t leave as waiting for 111! The kindness of fellow campers and hosts were wonderful. We would love to return and enjoy the beauty of the surrounding countryside another time instead of the inside of just a Motorhome! A quiet CL with level pitching, views all round, great walks for people and dogs in the countryside and along the canal but not far from Nottingham, Loughborough and the M1, A46 and A52. Two local villages with pubs serving food and a village a bit further with a Co-op. Directions : Situated 3 miles east of A46-A606 intersection. From the North: On A46 or A606 follow signpost for Kinoulton. Turn right at village green towards Hickling. The CL site is 0.75 mile on the left. From the South: Leave the A46 at Nottingham exit. At Island take the 3rd exit to Kinoulton village follow directions as above. The CL is located halfway between the villages of Kinoulton & Hickling.